The cervical spine is C shaped with its curve facing towards the back of neck. The spinal area in neck is called cervical spine and it is made up of 7 cervical vertebra. The cervical spine is a dynamic structure tasked with protecting nervous innervation to the entire body while also maintaining range of motion for the head and neck. 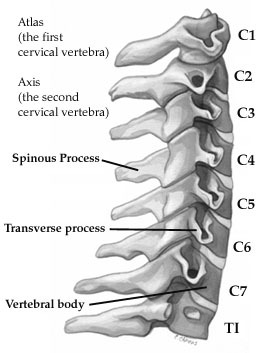 The atlas (C1) and the axis (C2) differ markedly from other cervical vertebrae. The cervical spine is composed of seven vertebrae (C1–C7), which provide mobility, flexion, extension, and rotatory motion of the neck. The cervical spine is divided into upper, subaxial, and cervicothoracic regions. The normal anatomy of the cervical spine consists of 7 cervical vertebrae separated by intervertebral disks and joined by a complex network of ligaments. These ligaments keep individual bony elements behaving as a single unit. The cervical spine naturally has a lordotic curve. View the cervical spine as 3 distinct columns: anterior, middle, and posterior. The middle column is composed of the posterior longitudinal ligament and the posterior one third of the vertebral bodies, the annulus and intervertebral disks. The posterior column contains all of the bony elements formed by the pedicles, transverse processes, articulating facets, laminae, and spinous processes. The cervical spine has a linear chain of correlation or reciprocal relationship regionally (within the cervical spine) and globally (head to whole spine). Numerous finite element models of the cervical spine have been proposed, with exact geometry or with symmetric approximation in the geometry. However, few researches have investigated the sensitivity of predicted motion responses to the geometry of the cervical spine. The goal of this study was to evaluate the effect of symmetric assumption on the predicted motion by finite element model of the cervical spine. We developed two finite element models of the cervical spine C2-C7. One model was based on the exact geometry of the cervical spine (asymmetric model), whereas the other was symmetric (symmetric model) about the mid-sagittal plane. The predicted range of motion of both models-main and coupled motions-was compared with published experimental data for all motion planes under a full range of loads. The maximum differences between the asymmetric model and symmetric model predictions for the principal motion were 31%, 78%, and 126% for flexion-extension, right-left lateral bending, and right-left axial rotation, respectively. For flexion-extension and lateral bending, the minimum difference was 0%, whereas it was 2% for axial rotation. The maximum coupled motions predicted by the symmetric model were 1.5° axial rotation and 3.6° lateral bending, under applied lateral bending and axial rotation, respectively. Those coupled motions predicted by the asymmetric model were 1.6° axial rotation and 4° lateral bending, under applied lateral bending and axial rotation, respectively. In general, the predicted motion response of the cervical spine by the symmetric model was in the acceptable range and nonlinearity of the moment-rotation curve for the cervical spine was properly predicted 1). Zafarparandeh I, Erbulut DU, Ozer AF. Motion analysis study on sensitivity of finite element model of the cervical spine to geometry. Proc Inst Mech Eng H. 2016 Apr 22. pii: 0954411916644634. [Epub ahead of print] PubMed PMID: 27107032.